Should You Use Emojis in 📧 Subject Lines? Emojis are, for better or worse, a huge trend for consumers. So it’s no surprise that more and more brands are choosing to incorporate emojis into their email subject lines. But do they work? A couple studies have come out recently saying they do, if used appropriately. Emojis have some pretty clear benefits for email marketing. By using emojis in place of some text, you’re able to convey more in less characters. The average mobile inbox only shows 30-40 characters in the subject line. By incorporating one or two emojis, you can take full advantage of that space. Plus with a couple of emojis in a sea of text subject lines you’ve got a better chance of grabbing your reader’s attention without affecting deliverability. According to the Emoji Use in Email Subject Lines report, which looked at emojis in emails compared to text-only subject lines throughout one year, subject lines using emojis has a higher read rate than comparable text-only subject lines. However, there is a risk of emoji email oversaturation as emojis become more and more popular for brands. 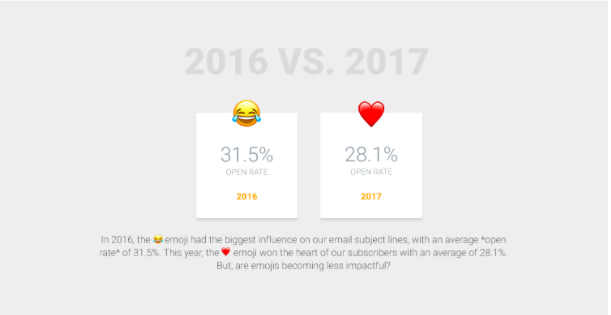 In a recent Mailjet study using a/x testing (testing up to 10 variations of the same email) they found that overall open rates with emails using emojis went slightly down from 31.5% in 2016 to 28.1% in 2017. The ❤️ emoji being the top emoji for open rates. So how do you make sure your emoji-laden email is one that gets opened? Stay consistent with your brand and tone — as a marketer you know your organization and audience better than anyone, if an emoji isn’t in line with your brand, stick to your gut and take it out! Test, test and test again before sending. Verify whether the emojis you want to use will render correctly across email clients and browsers. Implement A/B testing for your email campaign with a subject line using emojis and plain text to collect performance data. Don’t overdo it! Use emojis in moderation so you’re not oversaturating your audience. Make sure your emojis have a purpose. Whether they’re conveying an emotion, visualizing your brand, or just telling a story, don’t just add them because you feel like it. Do you ❤️ the idea of emojis in subject lines? Check out the Emojipedia for a full encyclopedia of every emoji that you can copy and paste into your email subject lines. You can also see how certain emojis should render on different devices or browsers. If you’d like more tips on using emojis for your audience or have some examples of brands doing emojis well, leave us a comment below. We’d love to hear from you!